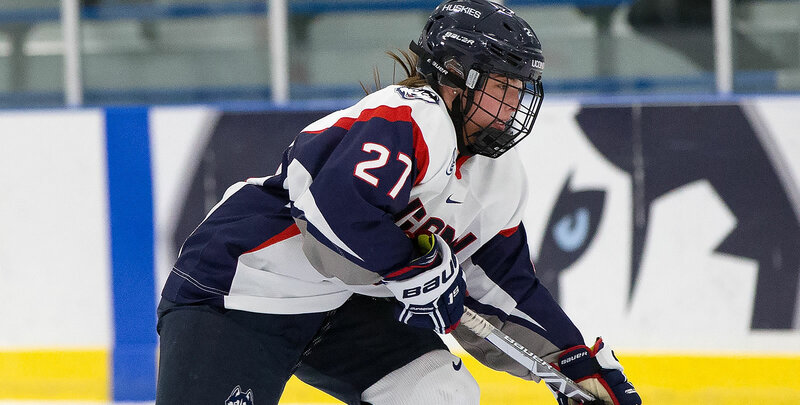 NEW HAVEN, Conn. - Despite two second-period goals from freshman Danika Pasqua, the UConn women's hockey team dropped its opening round game of the 2018 Nutmeg Classic to Quinnipiac, 3-2. Quinnipiac, now 4-7-3, led 2-0 after the initial period behind goals from Melissa Samoskevich and Lauren Lundblad. Following the intermission, the Huskies (6-8-1) played with much more urgency and fire power in the second session, using two goals from Pasqua to even the match at 2-2. After taking the initial punch from UConn, the Bobcats responded with a (what would end up being the deciding) goal to give them a 3-2 advantage. UConn outshot Quinnipiac 41-20, but was unable to get the late attempts to fall as the team searched for an equalizer in the waning seconds of the third period. Quinnipiac jumped out to a 1-0 lead eight minutes into the opening frame. At the 7:54 mark, Melissa Samoskevich glided into the crease and pushed the puck just under the pad of Morgan Fisher. The Bobcats increased their lead to 2-0 at the 13:35 mark after Laura Lundblad received a flip pass from Kenzie Prater and using a forehand to backhand move, flipped the puck up and over the hand of Fisher. The Huskies responded right out of the gate of the second period, drawing within one goal just 22 seconds into the second. Despite getting tripped up, Morgan Wabick showed great awareness and flipped a pass up to Danika Pasqua who put the biscuit in the basket. Pasqua got her second goal of the afternoon off a breakaway at the 9:03 point, placing the puck into the top left corner of the net to draw the Huskies even. After taking the gut punch, Quinnipiac regained a 3-2 lead on a power play chance after Samoskevich tallied a wrist shot. UConn entered the final period guns-a-blazing as the team searched for an equalizer. Despite holding a 17-2 shot advantage and having scoring opportunities right in front of the net, the Huskies were unable to capitalize and send the game to overtime. The Huskies will play the loser of Yale/Providence tomorrow in the consolation game at 3 p.m.